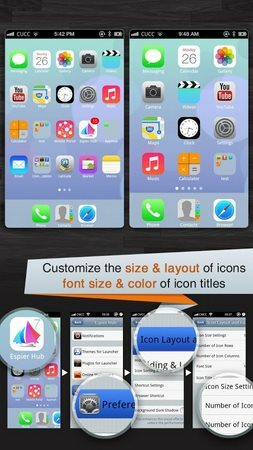 Espier Launcher iOS7 is the iOS7-style version of the best and the most popular iOS-style home app (Espier Launcher) for Android devices. In this version, you can experience the perfect Android implementation of iOS7 font, icons, search page, wallpaper, and animations. Now, you can feel the simplicity of iOS7 on your Android devices! * Flawless widget support; You can have multiple widget pages (up to eight). (You need to pay for an extra license). 5. AppHub folder reminds you the update of your apps in time. * Hide and/or lock icons (You need to pay for an extra license). * In order to remove AppHub floder, you need to pay 1,000 Espier Coins to get an extra license. * In order to change the default search engine, you need to pay 600 Espier Coins to get an extra license. * In order to show the Widget Page, you need to pay 900 Espier Coins to get an extra license. * In order to save the pictures from Online Gallery, you need to subscribe this function (500 Espier Coins per 30-day). let’s see how it feels ?? got this one .. it’s so cool.